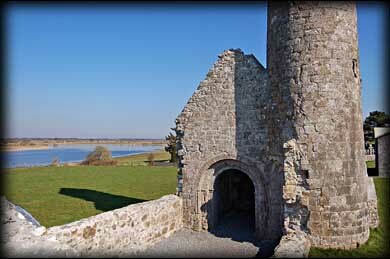 One of my favourite churches at Clonmacnoise is the quirky looking Temple Finghin. Built between 1160-70 it is one of two buildings of the Hiberno-Romanesque style at Clonmacnoise, the other being the Nuns' Church. What makes this church unique is the engaged 16.76 metre tall round tower. Access to the tower is through a ground level entrance in the chancel. 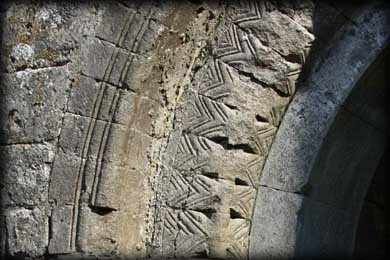 The tower, which has a diameter of 4 metres at the base, has a rather unusual herringbone pattern on the conical cap. The tower has seven windows in total, five of which are located on the south side, pictured left. A sixth window is on the north side, while the west window may have belonged to the Cathedral. The inner order of the beautifully carved Romanesque Chancel arch, which is believed to have been damaged by a fire, is a limestone replacement. In addition to the integration of the round tower, the church is also unusual in that it has a southern entrance, rather than the customary west doorway. 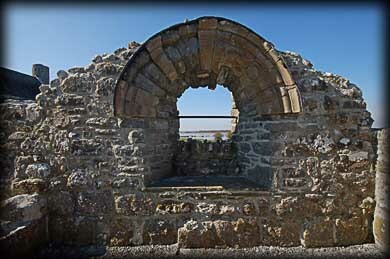 This is similar to the early Romanesque Cormac's Chapel at Cashel which has a north and south entrance. This building also had a major role in legislation for the protection of monuments after it was vandalised in 1864. Situated: Easy, located at the northern edge of the monastic site between temple Connor and the awful modern pavilion erected for the papal visit in 1979. Discovery Map 47 : N 0099 3073. Last visit March 2011. Door: Access at ground level in the chancel.